Where skiing meets climbing. A view of the Matterhorn from the Haute Route. Hello everyone, it’s Karen here checking in about the gigantic step from skiing to climbing. This year I’m spending the spring in the Alps guiding the Haute Route. 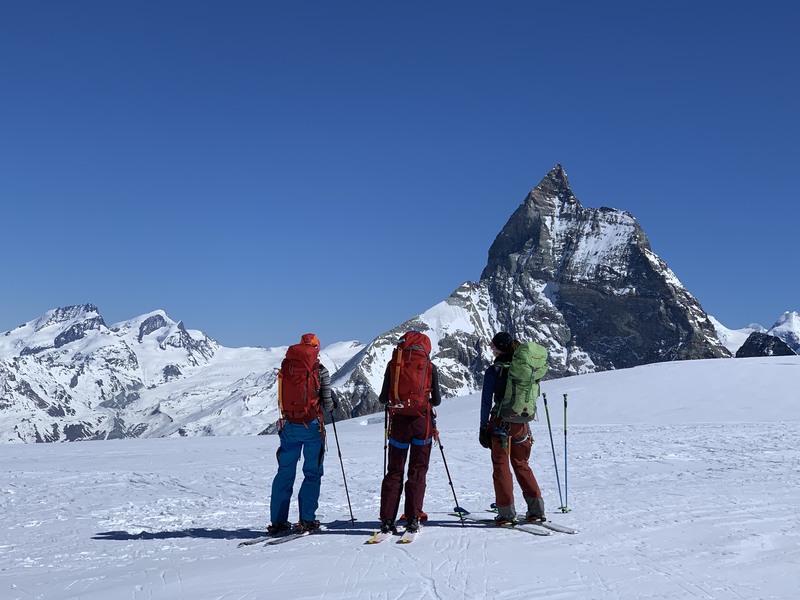 The Haute Route is a week-long, high-alpine ski tour that starts in Chamonix, France and ends in Zermatt, Switzerland. Along the way, we spend the night in mountain huts and traverse across big glaciers and high peaks all day. On Friday, my friend and co-guide, Caro North and I finished a Haute Route tour late in the evening. The next day we drove back from Zermatt towards Chamonix to start another Haute Route tour. Along the way we stopped at a local climbing crag. I felt like a beginner. Basking in the spring sun, warm rock under my fingertips, I felt happy. I also felt like a beginner climber again. Slowly and carefully, I explored the rock features. The footholds were so small and hard to see! Yet piecing the sequences together exhilarated me. After our climbing session (which did not take very long to get to! ), we continued to Chamonix. Changing seasons can be painful. Driving along, I got to thinking that changing seasons can be painful. I think it has to do with change being hard in general. Change often requires pushing yourself to take a step. It might be a different step, a next step, or a huge step. In this case, it is the step from one activity to another, the step from skiing to climbing. For me, stepping into rock shoes instead of ski boots always feels like a gigantic step. And every spring, I try to figure out ways to make that step feel smaller and more manageable. This time I had an advantage because I had Caro. Not only did I have a good friend to hang out with. In Caro, I had a super strong rope gun. Watching Caro lead up the climbs helped me figure out the moves when it was my turn to climb. Somehow mirroring Caro was part of the exhilaration I felt when I finally did the moves for myself, and it made me realize how important it is to have good partners. Climb with fun partners that you can trust and emulate. Stick to the easier routes. Seriously! Only do easy routes. Stop before your arms turn to spaghetti. Don’t set your expectations too high. Don’t define success by how hard you climbed. Define success instead by feelings of fun and exhilaration. The first day of rock climbing season should leave you with a smile on your face as you crack open the door to rock climbing season just a tiny bit.